It seemed like a good idea at the time. A lot of my “GM Bad Idea” stories could start out that way, presumably except the Envoy XUV, which couldn’t have seemed like a good idea to anyone, but was probably cheap to build. 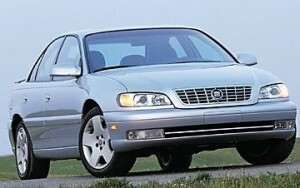 The Cadillac Catera is definitely an “it seemed like a good idea at the time” kind of car. In the late 1990s, Cadillac wanted younger buyers. This is totally understandable, since the Fleetwood Brougham was attracting the kind of people who thought: this vinyl roof looks spiffy! He was one of six mythical, beakless, footless martins or “Merlettes” in the Cadillac Crest before we gave him big feet, a giant beak, and turned him around. He’s quite a departure from his five brothers who have been part of the Cadillac Crest since the days of the crusades when the crest was the proud symbol of Le Sieur Antoine de la Mothe Cadillac Family. Strangely, Ziggy didn’t convince any young people to consider Cadillac, partly because the Catera’s 194-inch length was enormous by the standards of the day, and its 200-horsepower V6 was far from sporty. Still, Cadillac attempted a “Sport” model, which included, among other things, a three-channel garage door opener. The Catera was facelifted in 2000, and Ziggy left the same year; the whole thing was shut down after the 2001 model year. Fortunately, in 2003, Cadillac actually did come out with a rear-wheel drive sedan that attracted younger buyers – but Ziggy was gone for good. And as JT sings, “what goes around goes around goes around, goes all the way back around.” Opel landed back where they came from; the local Buick dealer. For some reason, in the late 90s, I liked the Catera. I thought it looked elegant then, but then I went to high school in south western pennsylvania where everyone either had a Subaru, an SUV or a Truck. The occasional muscle-car was the only eye-candy I’d ever see. Not like Miami where now I see 20 Porsches, 3 Lambos, 2 Ferraris and a Bentley on any given day. Don’t forget about Lisa Catera on “Chicago Hope.” How did GM marketing ever think that was going to work? My grandmother had one of these. I remember how surprised I was to find out that it was rear wheel drive. I’m not sure if I should be embarrassed or feeling nostalgic…but I have an original Ziggy stuffed duck thing sitting in my cubicle. Beeeeee jealous. Embarrassed, undoubtedly. Speaking of: what do you want for it?